East Flanders (Dutch: Oost-Vlaanderen [ˌoːst ˈflaːndərə(n)] ( listen), French: (Province de) Flandre-Orientale, German: Ostflandern) is a province of Belgium. It borders (clockwise from the North) the Netherlands and the Belgian provinces of Antwerp, Flemish Brabant, Hainaut and West Flanders. It has an area of 2,991 km², divided into six administrative districts containing 60 municipalities, and a population of 1,408,484. The capital is Ghent. During the short-lived Napoleonic Empire, most of the area of the modern province was part of the Department of Escaut, named after the River Scheldt. Following the defeat of Napoleon, the entity was renamed after its geographical location in the eastern part of historic Flanders; although the province is actually situated in the western portion of Flanders, in the contemporary sense of the word. The provincial flag has a black lion with red tongue and claws, on a background of horizontal white and green stripes. This is a recent adaptation; formerly, East Flanders used the Flemish flag, a black lion on a yellow background, as in the current coat of arms. The old flag is still publicly used, e.g. for road signs. Important rivers are the Scheldt and the Leie which merge in Ghent. The Dender merges into the Scheldt in the city of Dendermonde. East Flanders is divided into 6 administrative arrondissements (districts), subdivided into a total of 60 municipalities. In addition, there are 3 judicial and 3 electoral arrondissements. The capital and biggest city is Ghent, also the second largest city in the Flemish Region. 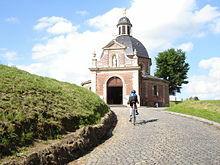 Other smaller cities are Aalst, Sint-Niklaas and Dendermonde in the east of the province. The eastern part of the province, part of the Flemish Diamond, is more densely populated than the western part. Six people chosen by and from the council form the daily government, called the deputation (deputatie). The deputation of East Flanders is a coalition of the political parties CD&V, Open Vld and sp.a. The biggest party in the council, N-VA, is not included. The daily government is led by the governor, who is appointed by the Flemish Government. André Denys (VLD) has been the governor of East Flanders from 26 November 2004 until 21 January 2013. Jan Briers, who is not member of a political party but was nominated by N-VA, succeeded him on 1 February 2013. The province has a yearly budget of approximately 300 million euro. ^ In isolation, Vlaanderen is pronounced [ˈvlaːndərə(n)]. ^ "The governor, province East Flanders". Retrieved 2006-03-14.